Franklin is, of course, more than a turtle — He’s a well-known children’s book character with his own long-running TV series from Nelvana. Well now Franklin has returned to Nickelodeon in Franklin and Friends, a new CGI series produced by Nelvana and Infinite Frameworks. Here’s a press release we picked up from Cartoon Brew: “Franklin is back and better than ever in the brand-new CG-animated preschool series, Franklin and Friends, premiering Monday, Feb. 13, at 9:30 a.m. (ET/PT) on Nickelodeon. 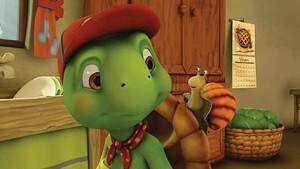 Based on the best-selling children’s book series by Paulette Bourgeois and Brenda Clark, published by Kids Can Press, the half-hour series follows a turtle named Franklin as he experiences adventures and milestones, learning lessons along the way with his pals Snail, Rabbit, Beaver, Fox, Goose and best friend Bear. The series emphasizes the importance of family, friendship, community, personal growth and helping others. Franklin and Friends, produced by Nelvana and Infinite Frameworks Pte. Ltd., will regularly air weekdays at 9:30 a.m. (ET/PT) on Nickelodeon.” The article goes into much more depth about the show, and includes a video snippet from the first episode. This turtle was my entire toddlerhood.